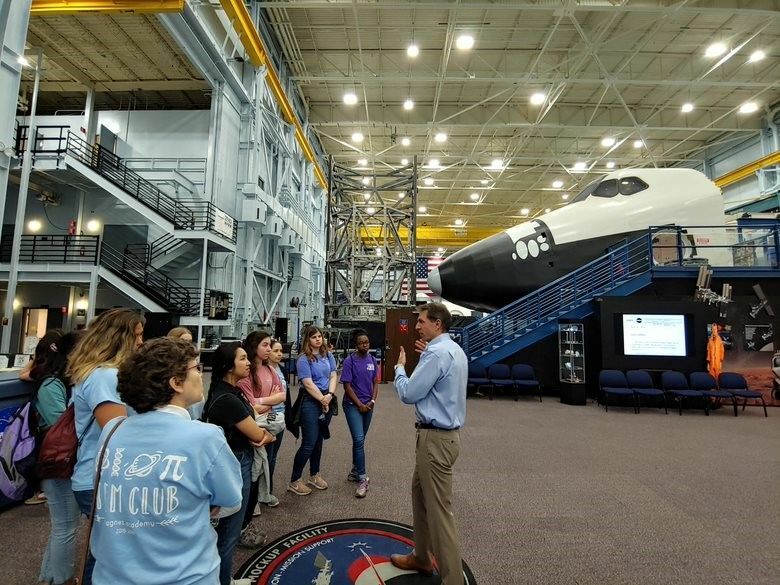 On Monday, April 8, the STEM Club kicked off their week at the NASA Johnson Space Center campus, where they had an exclusive, out-of-this-world tour. The students and sponsors were lucky enough to watch the astronauts perform a spacewalk on the International Space Station live from inside the Mission Control Room and tour mockups of parts of the ISS and space shuttles where the current astronauts train. Our girls also had the chance to see the lab that is developing the next generation of EVA spacesuits for missions to Mars and the moon and visit the lab for Micrometeoroid and Orbital Debris Protection. They met Zebulon Scoville, Flight Director of the International Space Station, as well as incredible women in STEM including as Mary Lawrence, another ISS flight director, and Jessica Watkins, a member of NASA's newest class of astronauts-in-training. It’s always important for our girls to explore their passions and meet inspiring role models to help develop their intellectual curiosity as Academy women.